My daughter and I attended Starfest again in late August and had a great time. 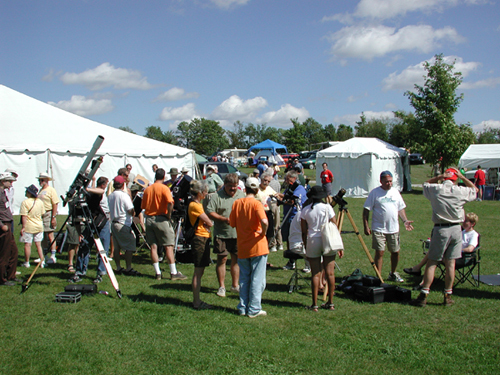 Starfest is Canada's largest Starparty with attendance of over 1200 amateurs, that gather to talk astronomy, listen to lectures and of course, look through telescopes. which gave a nice comparison view of the chromosphere and the photosphere. 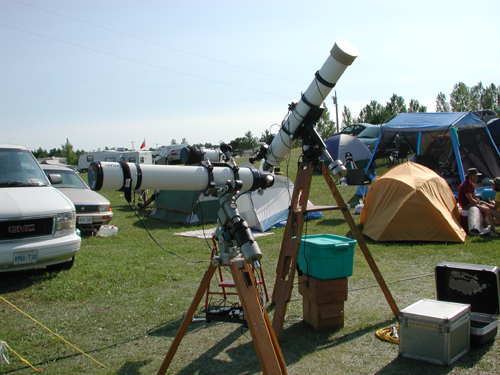 Most who looked through the scopes remarked that they enjoyed being ableto compare the views and it helped them to see more detail in each. One experienced observer said "I had the best white light view of the sun I have ever seen through PJ's 80mm Zeiss/Hershel Wedge combination. Of course, the HA view through the 63mm mounted right along side was great too!" 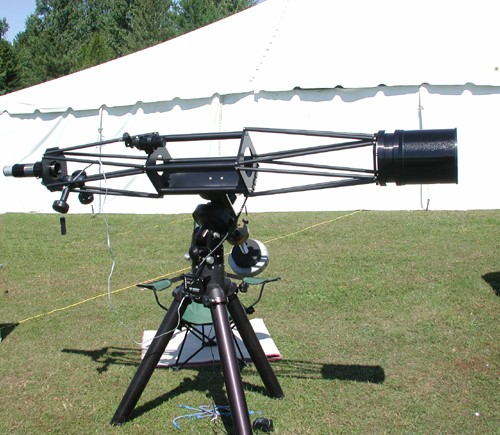 The scopes I drool over are the Apo refractors. Here are just a few of the AP Starfires on the field. 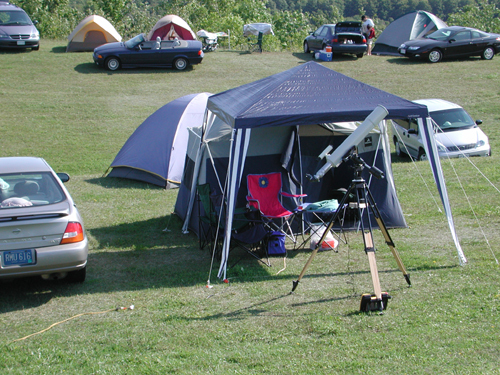 (with a Zeiss prism diagonal and a Zeiss 1.3X barlow for an effective focal length of 1300mm) to view Mars. The seeing was excellent and I was rewarded with outstanding views of a black sky surrounding a planet yielding a lot of detail. Not being an avid Mars fan, I can't name all the features I was easily seeing, but Mars was staring back as Solis Lacus (the "eye" of Mars) was quite distinct as well as the south polar region and several other markings. I couldn't get over the lack of scatter and wealth of contrast that the mono's gave. Several individuals who stopped by for a look, couldn't either. This fellow had it all. 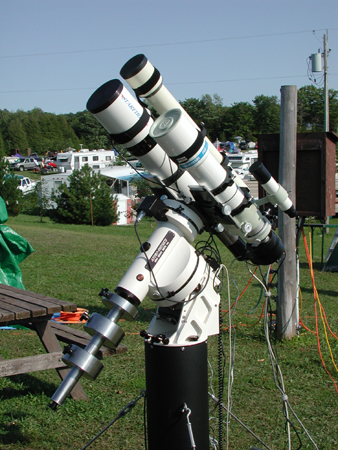 An AP130, Tak FS102 and an AP 80mm guidescope, on an AP 1200 mount. Starfest is always a fun event for both my daughter and myself, but both of these views made for a very memorable one too. This is Peter Ceravolo's unique 8" f/10 Apo. I was able to view Mars through it during some excellent seeing on Saturday – Wow! My daughter and I were able to help out again this year, with the open solar viewing on Friday. Mine is the double scope to the left. I set up my 80mm for "white-light" and my 63mm for h-alpha, which gave a nice comparison view side-by-side.